Remember, you have three days to complete the hop and your name is entered to win the grand prize for every comment you leave along the way! Plus, you have a chance to win some Tim Holtz / Ranger blog candy here if you comment! contest is now closed. Also, this sketch is the March Challenge on the Scrapbook365 blog and it’s open until March 15 so you should play along and maybe win a prize over there too! Leave me a link in the comments if you use it – I’d love to see what you do. For now, hop along to Lori and give her some love! Sara Case Strickland <– That’s me! A-MA-ZING I love the mist, the arrow, the twine … all of it! Great job!! 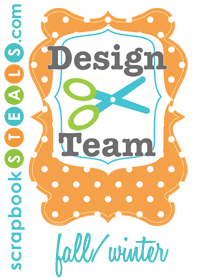 Love the blog hop.. lots of great takes on a sketch. I love a sketch challenge and all of the ways people interpret them! Thanks Kelly! Glad you enjoyed it! LOVE your layout! So totally love the colors, layers, pp designs, embellies and paint splatters. Fab photo too!! Sara, I always love your layouts! 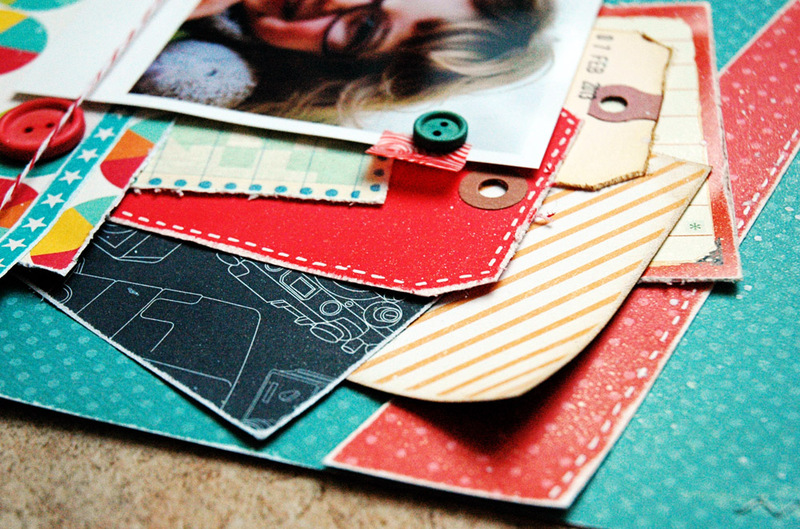 Love those colours, all the little details, like the sanding and the stitching and that pic of M, she is so cute! And I agree with one of your earlier comments, the Paperie’s February kit it my absolute favorite so far! Loved your LO. The colors are great together. I have to get some of that mist!! What I have is more glittery than solid colors. Sara, as usual You have made a stunning LO that I am absolutely in love with!! You did an awesome take on the sketch and used the Paperie Feb Kit amazingly!!! Love the layering and misting.Its neat how you used both real and fake stitching on the same LO. The pic of M. is adorable. Wow1 love your take on the sketch Sara! Gorgeous colour combo and I love all the texture you have added . thanks for the close up shots! Thanks Michelle and you’re welcome! As always, your work is stunning!! Love the arrow and the splatters and stitching!! So glad you were able to do a layout just for you (maybe?!?). Did you use mostly the Feb kit? Thanks Cathy! 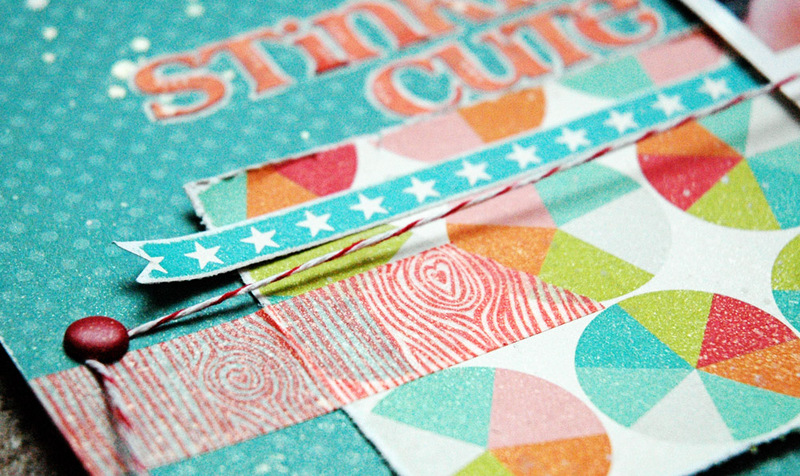 And yes, it’s mostly the Paperie February kit – my all time fave from them! Thanks Norine! And blog hops are fun – enjoy the rest! Awesome LO! Love the color! This is super! 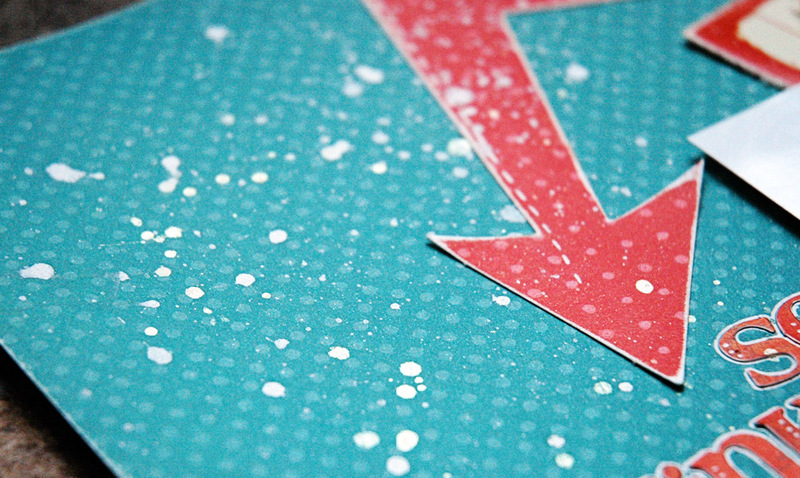 Love the colors, the big arrow, the splattering of ink….. GREAT page! Wowie, love your layout Sara! Thanks Brandy – I’m a fan of bright colours! Great layout, really like the red arrow. Thanks Darlene – a bit of shimmer is always a good thing! Your colors really draw you in to the layout. Amazing page! Fabulous page! I love the bright colors and that adorable photo! 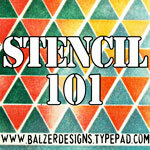 I’ve gotta try using the white paint flecks – they look awesome! Thanks Brenda – white mist is amazing! Wonderful layout. The colors look so nice together. The layout really pops! I love the colors in this…so bright! Wonderful layout! Lovely layers! Oooooh red washi wood grain! 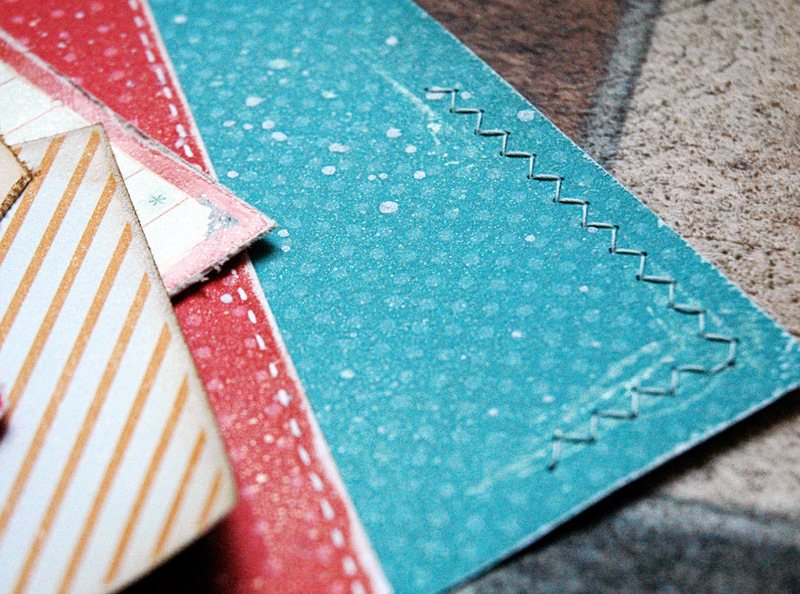 Thanks Rhea – I love that heart woodgrain washi too! 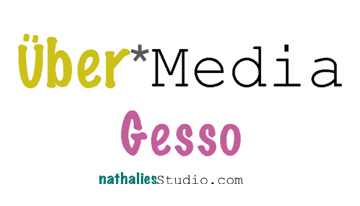 Love the colours, love the arrow!, love the title, love the *adorable* kid, love everything!! You rocked it!! Thanks Corina – she really is an adorable kid! Hi Sara !! What a beautiful layout !! Loving how all of our layouts are so different, yet use the same sketch !! I love all of your beautiful colors … Great job !! Thanks Catherine – I love to see how different styles completely change the same sketch! So Stinkin Cute is so stinkin cute! I love blog hops. So much fun to see what everyone is doing. And, I can even win something! Woo Hoo! Thanks so much for the opportunity! Love your style and flair – your work is always full of subtle details that sets it apart! Gotta say – love the title too! Gosh! Thanks Tash! And my friend gave me the title idea – I’m terrible at titles! 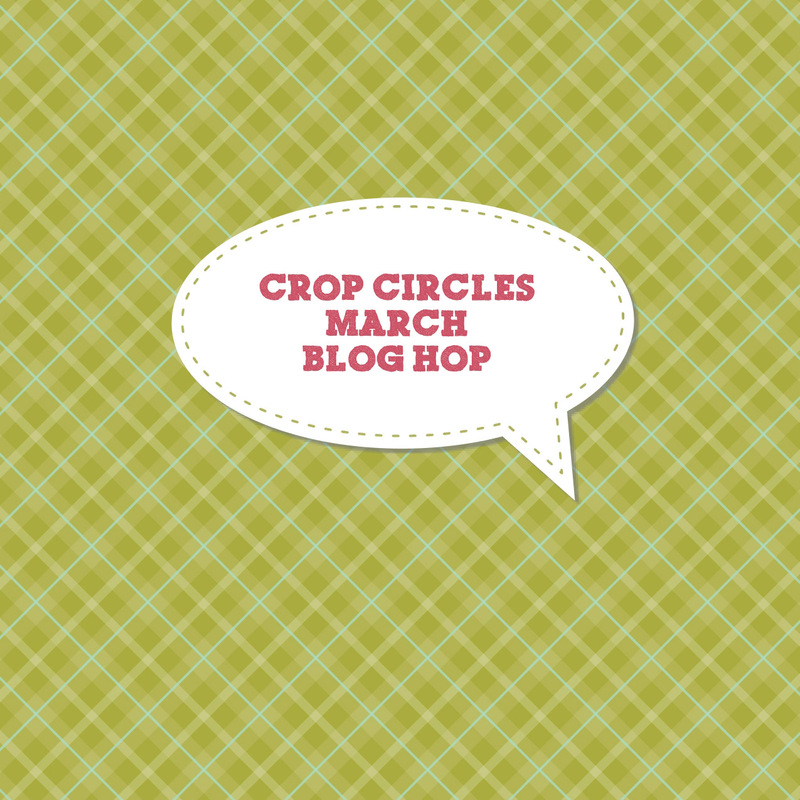 HI Sara, Thanks for sharing your part in the cutely name Crop Circles Hop. I love your layout as it has so many interesting techniques… you got layering down pat!! I You even have some sewing. I’m yet to do alot of sewing on mine. I have a new machine and kinda scared that sewing paper might do something??? maybe I’m just paranoid LOL Once again..Thanks for sharing! Thanks Sherry! And sewing on paper is so easy – it doesn’t really matter if you have straight lines or not because crooked lines just add to the texture and visual impact (wink, wink!). Go try it out!